3 Aprile 2019 – W.A.P. In the middle of the Southern Ocean, time is measured in latitude and longitude, wave height and wind speed and the proximity of an iceberg. 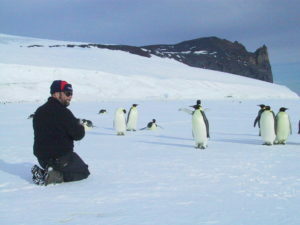 Ice is the language of ocean and land in the waters around Antarctica, and it is on the floating platforms of ice, those liminal places between land and ocean, that emperor penguins gather every year to mate and, if conditions are right, to lovingly raise their chicks. The largest and heaviest species in the penguin family, the emperor was given its scientific name, Aptenodytes forsteri, in honor of Johann Reinhold Forster, the naturalist on board James Cook’s second voyage to the Southern Ocean. (Aptenodytes means “featherless diver.”) Forster was likely the first person to see the bird, although he mistakenly identified it as a king penguin, the emperor’s closest relative.